Effective decisions are crucial to the success of any software project, but to make better decisions you need a better decision-making process. In Evaluating Project Decisions, leading project management experts introduce an innovative decision model that helps you tailor your decision-making process to systematically evaluate all of your decisions and avoid the bad choices that lead to project failure. 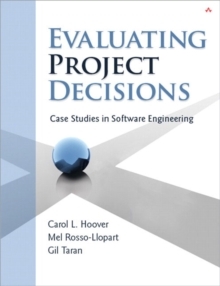 Using a real-world, case study approach, the authors show how to evaluate software project problems and situations more effectively, thoughtfully assess your alternatives, and improve the decisions you make. Drawing on their own extensive research and experience, the authors bridge software engineering theory and practice, offering guidance that is both well-grounded and actionable. They present dozens of detailed examples from both successful and unsuccessful projects, illustrating what to do and what not to do. Evaluating Project Decisions will help you to analyze your options and ultimately make better decisions at every stage in your project, including:Requirements-Elicitation, description, verification, validation, negotiation, contracting, and management over the software life cycle Estimates-Conceptual solution design, decomposition, resource and overhead allocation, estimate construction, and change management Planning-Defining objectives, policies, and scope; planning tasks, milestones, schedules, budgets, staff and other resources; and managing projects against plans Product-Proper product definition, development process management, QA, configuration management, delivery, installation, training, and field service Process-Defining, selecting, understanding, teaching, and measuring processes; evaluating process performance; and process improvement or optimizationIn addition, you will see how to evaluate decisions related to risk, people, stakeholder expectations, and global development. Simply put, you'll use what you learn here on every project, in any industry, whatever your goals, and for projects of any duration, size, or type.